For the better part of a decade, Amazon has been rolling out e-readers, tablets, and a box that you hook up to your TV while building up a library of content available on all of them. Now they’re hoping they can replace the device you always have on you and spend the most time on: your smartphone. It’s a bold move. At this point, most people have already decided where their smartphone loyalties lie. Some people are in love with Apple’s iPhone, while others like Android and either have a preferred brand or bounce around between manufacturers based on price, specs, design, or a number of other factors. While it costs the same $199 on contract at AT&T (or somewhere in the $20-25 per month range, if you want to pay the full $650 over time) as other flagship devices from its competitors, the Amazon Fire Phone packs in 32 GB of storage standard, gives you a free year of Amazon Prime, and throws in unlimited photo storage in Amazon’s cloud to boot. Those who pick their smartphones upgrades by focusing on bang for your buck might be won over by the included goodies alone. Most people will find their basic smartphone needs met by the Fire Phone. There’s email, texting, a basic note-taking app, and so on. The screen is 4.7 inches, the same size as rumored for the new iPhone coming this fall. At 720p, it isn’t the highest resolution screen on the market, but most people probably won’t notice — video still looks gorgeous. The camera is fine — at this point, I think most people can’t really tell the difference between photos taken on most high-end smartphones anyway. Inside, the Fire Phone is packing a Snapdragon 800, 2 GB of RAM, and an Adreno 330 GPU. In practical terms, that means it won’t have trouble keeping up with whatever apps or games you throw at it. In several days of use, the Amazon Fire Phone only stuttered for more than a few seconds one time, an issue that was cleared with a restart. Basically, it’s about as fast and reliable as you could hope for. Now that phones are getting bigger, manufacturers have to put more thought into where they put the physical buttons for volume, power, and accessing the camera. Most big Android devices put the power button on the side, where it’s easier to reach one-handed, but Amazon instead put the camera button in that spot and the power on top. I think these should be swappable in software — personally, I turn the screen off more often than I take photos, and reaching the top of the Fire Phone is a stretch for most common hand positions. Amazon’s app store has most of what you expect, like Facebook, Twitter, Instagram, and the most popular games in Apple’s App Store or the Google Play Store. But once you get past the apps that should obviously be on any modern platform, the pickings are rather slim. And because most apps are simply straight ports from Android, many app store pages show images that were clearly taken from a standard Android device, as the navigation controls and status bar are still present. It doesn’t hurt the experience, but it also doesn’t give the impression that you’re using apps built to take advantage of what Amazon is providing. What does hurt the experience is that the device asked for my Twitter and Facebook account info at setup, but didn’t use that data to log into these apps when I downloaded them from the app store. I don’t like giving out my data without good reason, thank you very much. Amazon took great strides to make using the Fire Phone feel different from what you get on iOS or in “regular” Android. It’s running a fork of Google’s operating system, with a completely different look and feel from what you get in the “stock” version. Those who have used Amazon’s Kindle Fire tablets will recognize the Carousel interface on the home screen, which shows the most recent apps used. Below each app on the Carousel is a stationary widget showing relevant notifications. The mail app might show a message from your inbox, or the Fandango app will show nearby movie times. Apps not built specifically for the Fire Phone instead show links to similar apps in the app store, a feature that’s useful while you’re just getting everything set up on the device but disappointing once you’ve been using it for a while. Things that should be there just aren’t: Twitter doesn’t show recent mentions or retweets, Facebook Messenger doesn’t show recent conversations. Besides the Carousel, Amazon breaks from the stock Android mold by introducing a three-panel interface across its home screen and apps. Accessible via a flick of the wrist or a swipe from the edge of the screen, the left panel is used to give quick access to menus and settings while the right panel shows nifty shortcuts, like attachments you’ve recently received in the email app or your recently taken photos in messages. It’s supposed to make one-handed use easier, but the motion detection isn’t as reliable or quick as using an old-fashioned swipe. The most flashy gimmick on the Amazon Fire Phone is Dynamic Perspective, which uses four infrared cameras to track your face, instantly redrawing things on screen at new angles to give the illusion of depth. It’s really cool looking the first time you see it, but outside of making the lock screen more enjoyable to look at it doesn’t add much to the experience. I can see how it would work well in games, as moving camera controls to a combination of tilt and head movement makes it easier to map other buttons onto the limited screen space available. 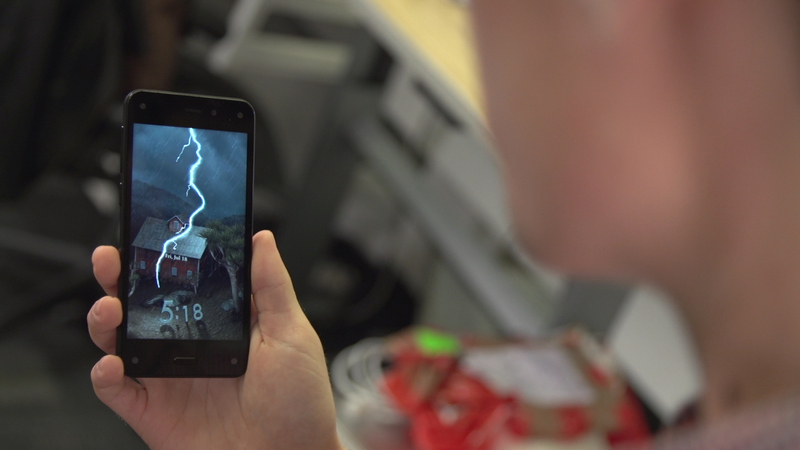 The Fire Phone’s other standout feature is Firefly, which lets you point the camera at physical products with a label in your environment and find them on Amazon (or in other databases of products, once outside retailers start taking advantage of the tools to build on top of Firefly that Amazon has given to developers). Firefly can also identify music, television, and movies, useful for those with friends who watch. It also lets you pick out email addresses, phone numbers, and other info, making it a decent app for keeping notes as well. Amazon has had an app on iOS and Android that offers similar functionality for some time, so it will be interesting to see if Firefly makes it over to other platforms or if Amazon decides to keep this more advanced version on its own device. Speaking of things you only get on Amazon’s devices, consuming media on the Fire Phone is a better experience than what you get on other platforms. Movies and books are treated like apps in the home screen interface and Carousel, so if you don’t want to open the Kindle or Instant Video apps, you can simply pin whatever you’re reading lately to the front and have immediate access. If you have a commute that puts you outside of cell range regularly, you can also download TV episodes available on Amazon’s subscription service for no extra cost — on the iPhone or iPad apps, you still have to pay separately for each episode before you can download. Avid readers will enjoy the auto-scroll feature that takes advantage of the cameras used for Dynamic Perspective to move down a page of content while you’re looking at the phone. It works well in the Silk web browser, but it wasn’t available in the Kindle app in the build given out to reviewers. I also wasn’t able to buy a book from the Kindle app and had to jump over to the web browser, which I found kind of hilarious given the outrage over the fact that you can’t buy books from the Kindle app on the iPhone. Even for those who only care about consuming content, the fact that you can only use the Fire Phone on AT&T might be a deal breaker. People can be as die-hard about their choice of cell carrier as their choice in operating system, and many simply won’t want to give up the reliability of Verizon or the low prices on T-Mobile. Still, I think there’s a market for the Fire Phone. Some people really don’t care about Google Now or having access to the latest app fads. Those who have fallen in love with Kindle Fire tablets and buy all of their content through Amazon — or don’t pay for any content at all thanks to Amazon Prime — might find that the Fire Phone is perfectly capable of meeting all of their needs.